This place, Balahisar Namakmandi Food Forte started its services in Peshawar about two weeks back. I saw its ad on a billboard and a visit was deftly planned on a quiet and hot summer weekend. The place is located on Abdara road in front of Dar-e-Arqam School. It is in an old house that has been renovated, and decorated very tastefully. 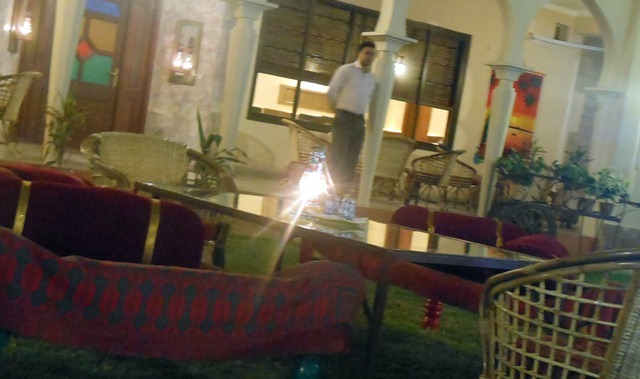 The two lawns one to the front and other to the back have charpoys and chairs laid, besides a Diwan with embroidered Gao takyas. Colorfully painted lanterns placed on table in the center give it a beautiful look. The rear lawn is for families only. I suppose after September it would be fun to have dinner outside. 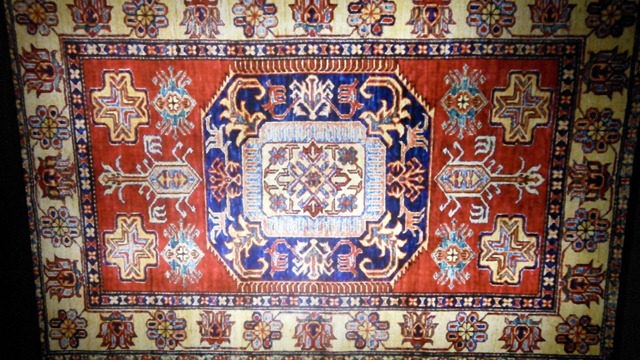 The inside comprises of four rooms decorated in traditional style. You can choose to sit on the floor (on cotton filled mattresses), the sofas or the chairs. Each room has a different theme. 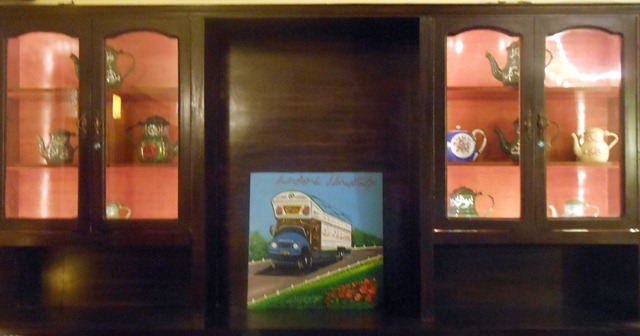 Most of all liked by me and begum sahib was the room with Truck art theme. Amazing decor and ambience. The walls have been decorated no less tastily. There’s color everywhere. In decor alone this place stands out. Bravo! 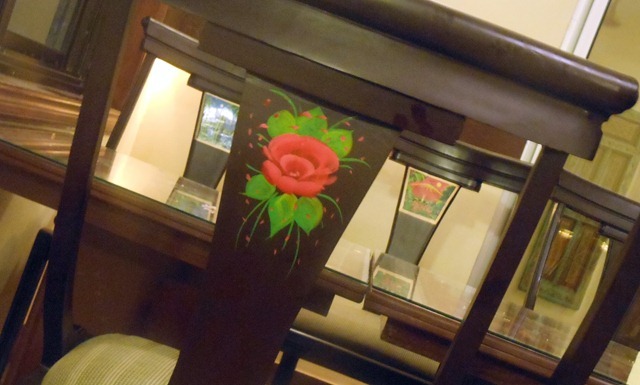 I found impressive floral drawings on the chairs, tables and almost everywhere. The staff was as cheerful as can be expected from a new outlet. And off course its all backed by the wily generator for should the power breakdown, which in fact does a lot nowadays. I am told this enterprise is by the same people running the Coffe Pot. Well, more power to them. May they bring out even more aesthetically decorated restaurants. This chair and the others alongside it stood out. This dinner wagon looks awesome. And yet, there’s more of it. Let I forget, need to tell you about the food. The sang-froid waiter served us chilled Sugarcane jiuce on arrival. 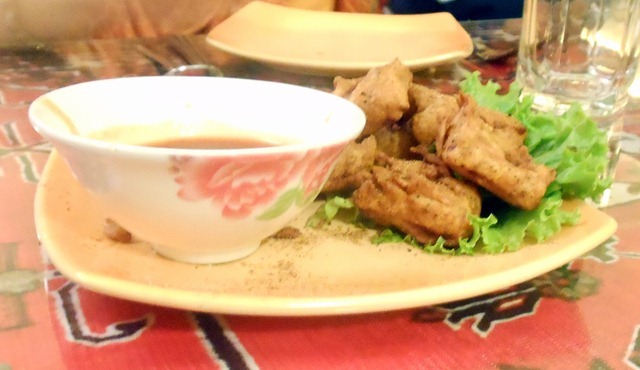 The menu boasts of anything and everything related to chicken and meat (Boned or boneless). We ordered a Mutton karahi, chicken seekh kebabs, chicken boneless handi (Serving for two), nan, salad, raita and fish in foil. Cottage cheese pakoras made up for the appetizers. These were served sooner than expected. The food came in a little late, more than 50 minutes! But to make up for it the manager gave us a serving of Ginger nan, piping hot! The food was simply great, specially the fish and Karahi. Not very oily, hot and tasty. The meat was well done and fat free. After having had filled our bellies we ordered some Gulab jaman and Kulfi Faluda, which tasted just as good. This was all washed down with green tea. For what meal of meat would be complete without green tea? 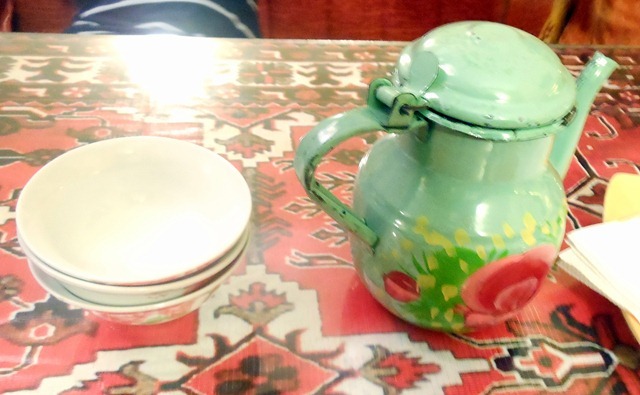 And I just loved the gaily painted tea pot. I think its a pretty good place with very good atmosphere and decor. The food matches the ambiance no less. The service was a tad bit slow. But off course they will improve it. The rates were a little on the higher side, but that is to be expected from a place like this. After all this is not your usual Charsi Tikka shop. Guys, just make the service a little fast and I will rate you excellent next time. One downside is the absence of enough parking space inside or in front of it, since it lies on a main road which is quite busy. A nice place to be, if want the traditional food without having to go to the old Namakmandi or even the inevitable Charsi. Glad to see you webpage on Peshawar, nice reviews on restaurants. Thanks keep visiting for more interesting stuff. Thank you for your lovely blog. We’ve posted it on our facebook page. 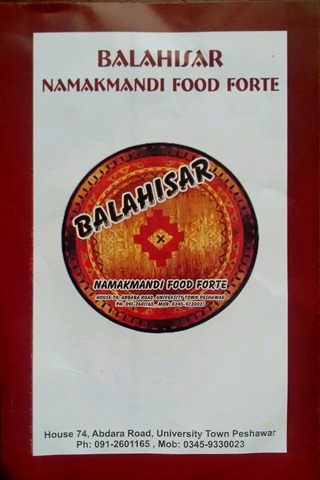 We look forward to seeing you at Balahisar Namakmandi Food Forte again!